An impedance of 50ohm is highlighted in the Field Components SMA Reverse Polarity Female Bulkhead RG400 Cable Assemblies. The SMA Female Reverse Polarity Bulkhead to QN Female is constructed using RG400 cable. 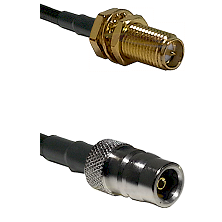 The SMA Reverse Polarity Female Bulkhead RG400 Cable Assemblies RPSMAFBH-RG400-QNF-Length are precision manufactured using highest quality RF and Microwave coaxial connectors.